In the empty space which separates two instants of awareness, radiant spatiality is revealed. When you have breathed in or out completely, when the breath movement stops on its own, in this universal lull, the thought of “me” disappears. In this technique, we don’t hold our breath between inhale and exhale; we let our breath flow continuously, just as it naturally does. The breathing techniques of the Living level are about facilitating changes which will help to dissolve any disharmony, in experience. At the level of Knowing, now we let breath flow in and out automatically, just as it always does; this technique isn’t about breath; it’s about mind, and the power of getting in touch with the parts of your mind which have been unconscious, thereby uniting our mind and knowing our own power, the power which will take us in the true nature of our unbound awareness. And so, while breathing naturally, we catch the gaps, the slight pause between the inhale and exhale. Notice how during the gaps there are no thoughts. Try to notice, and remember, how it feels between in breath and out breath. Get the feel of it; the literally sense of it. Now try to take that feeling, that stillness, with you into the breathing. It’s a very subtle movement of stillness into your inhale and exhale. At first it will be a very short moment of silence that may be easy to miss, but you will soon be able to feel the stillness moving into your every moment. It’s very simple, really. Normally, when breath flows out, attention flows out with it. That’s fine, that’s natural. However, a lifetime of conditioning which favors focus on external things has created an artificial dynamic, where all our attention flows out with our breath. It’s the all that’s artificial. In catching the stillness which we can easily and naturally notice at the junction of our inhaling and our exhaling, we consciously experience and become familiar with our actual subjective awareness. When we exhale, most of attention flows out into perception and the objects in perception, but a bit of stillness, a bit of awareness, also naturally remains. After using this technique for a while, each day, we begin to notice that this stillness really does feel more than natural; it feels like who we are, actually, and it is. Another way to access the gap, the silence is between two thoughts. So we try to find a gap between two thoughts. A thought arises and subsides and the next one arises. Between the points of a thought subsiding and the next thought arising is a gap. So we identify these gaps and experience the silence there is between two thoughts. Try to remember the feel of this experience, and without effort (very subtly) try and pull this experience into the next thought; just let it come along with you, so to speak. Also try to increase the duration of these gaps between the thoughts. So make an effort to delay the next thought hence prolonging the gap. In a similar manner to the breathing techniques of the Living level, this unity of breath and mind at the Knowing level is an artificial means to reintegrate the natural experiencing of our own awareness, and its flowing, its breathing, between subjectivity (our actual experiencing awareness) and objectivity (the objects, the forms, in each moment of experience). In reality, the duration of the gap and the duration of a thought are the same; what we’re calling the gap is actually the ground of being, of pure, undistorted awareness, which underlies all perception and all perceived objects. However, until we’re well past the halfway point of the Knowing level, we experience the thoughts more than the gap because we focus more on the thoughts. If we can slowly relax our focus, and let ourselves rest attention on the gap, we can actually increase the time we spend in the gap/the stillness for longer periods than we do in thoughts. Another way to access the gap is with sight. Focus on an object, then slowly get that object out of your focus and focus on something else, the point when neither of the objects are in focus. It can be very simple. For instance, you’re presumably reading these words on a screen or a printed page. Take a moment, and let your vision move from these words to your hand. There’s a point where the words effectively dissolve from your consciousness, as your hand rises in your consciousness, even if it seems to happen very quickly. Just as with breathing into the gap, by seeing into the gap, you’ll be able to experience the exact junction-point between the two moments of perception. This may take a bit of practice, but ultimately, the dynamics are exactly the same as they are with the breathing-centered gap technique, described above. You can do this with any sense or perception, or combination of them. Notice the temperature in the room your in, and then focus on the loudest sound you can hear. 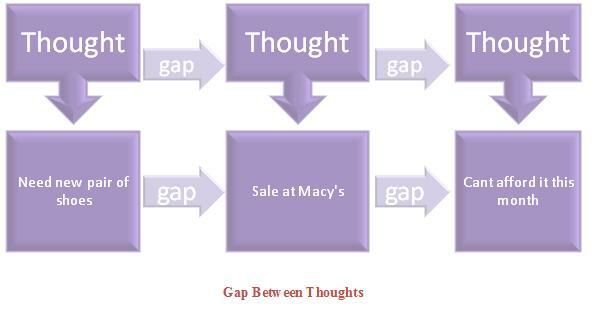 The gap is available between the exact junction point, between any two moments of perception. This is because the “gap” is actually the return to the stillness of the part of our consciousness that is always at rest. Just as your lungs are never entirely empty of air, or your heart is never empty of blood, so your mind is never entirely empty of consciousness; it may seem to flow out into perception and objects of perception, entirely, but it doesn’t. In a manner virtually identical to air in the lungs, or blood in the heart, there’s still consciousness remaining in mind, to be experienced as the self who is the experiencer of the moment. Losing touch with awareness of this self entirely is not natural, but a lifetime of conditioning has almost all of us doing this anyway; all day, every day. One of the more amazing things about all this, is the techniques described here were developed many centuries ago, when there was no scientific ability to measure the actual activity of the brain. Today’s instruments can and do track the exact fluctuations in dominant brainwaves as well as minute neurochemical and neuroelectric activity in the brain. All these expensive, sophisticated instruments reveal something very interesting: they reveal that between every moment of perception, there is a gap. Something that those of us involved in following the map to Living Unbound have known and reported for millenia. And, by the way, if we can catch the gap between our thoughts, or other perceptions, we don’t need to practice it with our breath. 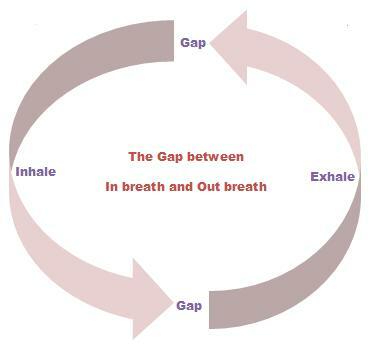 Experiencing the gap by using our breath is what we need to do when we cannot access the gaps in our thoughts; our breath is simply the most physical means of access, and therefore the easiest as we start using this technique. Working on this technique with our thoughts, our perceptions or our breath through the day, every time it occurs to us, we’ll soon become familiar with the stillness that’s not only available to us every moment; we’ll realize it’s the stillness we actually return to, every moment, whether our surface attention notices this or not. Every time we remember to take ourselves into the gap, we’ll also see if we can take this gap into our activity. We’ll see if we can allow ourselves to begin to consciously operate from this gap, bit by bit. We’ll soon begin to feel an amazing sense of unity, of power, and of knowing in our ongoing experience. We’ll begin to notice that we no longer feel off-balance emotionally, mentally or energetically as we go about our day, bit by bit. And we’ll just be easy with it; have fun with it. It’s amazing to experience at first, it feels good, and it’s fun, but there’s also no rush, whatsoever. Because the gap is always, ever actually here. It’s the ground of being; our true nature; the self spoken of in descriptions of self-realization. And as we’re now beginning to see: it’s our very self, and it’s not so very far away after all; how could it be? In closing. an expansion of the basic technique is to allow part of awareness to remain resting with our self, no matter what else we are doing. So if we are reading this technique, we’ll likely find ourselves completely focused on that task, on the words we’re seeing and reading. Now, though, let’s catch the gap if we can. If we can’t, we’ll try using the breath for a moment. Feel it? The gap? Yes; the stillness; the stillness at the opposite end of perception from the words; always here, just usually not noticed. Until now. How powerful is this technique? The yogic science of Kashmir Shaivism originally produced only a handful of total volumes outlining its teachings and techniques, in 8th through 12th century Kashmir. Only one volume was devoted solely to techniques. Only one technique is described in this volume: the gap technique, described above. The full volume simply offers one-hundred and twelve variations on this single technique. The volume is called the Vijnana Bhairava Tantra; the “Volume on Knowing Unity”.